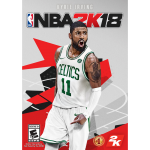 While a lot of PC gamers have already moved on to NBA 2K19, there is still interest in updating last year’s game. Today’s lone file addition for NBA 2K18 PC is the latest version of Torogi’s roster update. Download it at the link below!